In my previous post The Four Ages of Life I offered a model for understanding spirituality as a deeply interior experience that evolves through the lifespan. The entire arc progresses – or more commonly, meanders – through Four Ages, different in duration but organized in such a way that each one builds on those before it, carrying forward also their shortfalls and incorporating them into the developing whole. 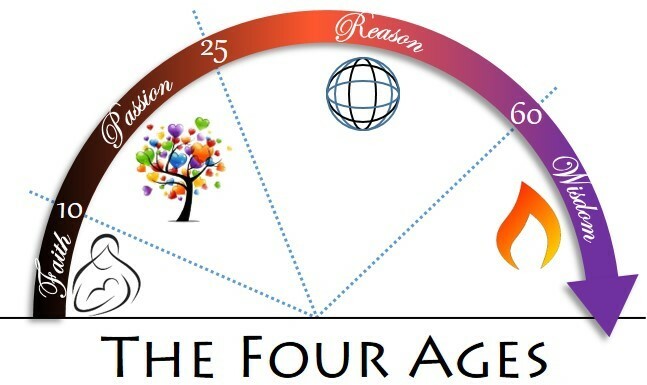 A stage model is nothing new, but as far as I know the specific themes that I associate with the Four Ages comprise a unique theoretical arrangement. By following the progress of spirituality – instead of, say, physical maturity, emotional, intellectual, or ethical development – I am also hoping that this scheme of Four Ages of Life will open a constructive dialogue on the topic of religion. I’ve made a case elsewhere, and many times, that religion should not be identified only with the organized brands evident around us (Christian, Buddhist, Jewish, Muslim, etc.). As a system of utilities (stories, values, practices and beliefs) which connects us to the grounding mystery within, to others in community, and to the turning mystery of our universe, religion is everywhere. But most importantly it’s how you put it all together. You may borrow from the tradition, mythology, and symbols of a name-brand world religion (or more than one), but however you keep the concerns of existence, meaning, and daily life aligned together in a working system is your religion. Another application of my Four Ages model has to do with that gold standard of transpersonal psychology known as self-actualization (A. Maslow). The conventional understanding of self-actualization regards it as a rather distant goal of psychological development, where the fulfillment of lower needs (survival, safety, belonging, and self-esteem) provide conditions for a breakthrough beyond the limited experience and perspective of ego. The fact that self-actualization is defined as the salient marker of transpersonal consciousness restricts its meaningful application to that point (and beyond) where an ego is securely in place, since ‘going beyond’ (trans) the personal presupposes a separate center of identity as the person we are. Instead of a later-in-life achievement, self-actualization could be measured as the degree in which an individual is realizing his or her human capacity at each Age of Life. In addition to a transpersonal variety, then, we can also give attention to pre-personal self-actualization – achievements in the progress of spirituality that precede the formation of a personal identity. In that case, a young child might be self-actualized not in terms of wisdom but of faith. And not only pre-personal, but even personal modes of consciousness could be interpreted according to whether and what degree one’s ego facilitates the realization of his or her human capacity at that time in life. The above diagram pulls forward the lifespan arc model of my previous post, but with an important change. Besides conceiving the different Ages of Life in terms of chronological periods of time, each Age is depicted as a circle (or cycle) turning continuously in its own phase space. In other words, even after you have become an adult and are building out the meaning of your life, the dynamic of Faith continues to turn deeper below. Just because the critical period for a trusting release to reality is behind you doesn’t mean that the primary concern of that Age of Life isn’t continuing to affect everything about your adult engagement with reality now. In the same way, each previous Age of Life continues to shape the development of spirituality over the lifespan. You should notice a purple meandering line coursing across the Four Ages, making for a less schematic trajectory than the arc in the background. If you follow the meandering line, you’ll notice that its forward progress moves through alternating clockwise and counterclockwise revolutions of the Ages themselves. This is meant to suggest that, while progress is propelled by a gearing-together of our four themes (faith, passion, reason, and wisdom), it is possible for us to lose forward momentum and get ‘stuck’ inside the centripetal spin of one or another. We’re back to the example where insufficient faith in reality keeps us obsessing over concerns around security and trust. So, even though our chronological age indicates where we perhaps ought to be in terms of our developing spirituality, complications and difficulties earlier in life can persist in holding us captive. This allows the model to be individualized according to our unique path through life. More free-moving here, a little hung up there. Advancing toward self-actualization in this aspect, but somewhat impeded in another. 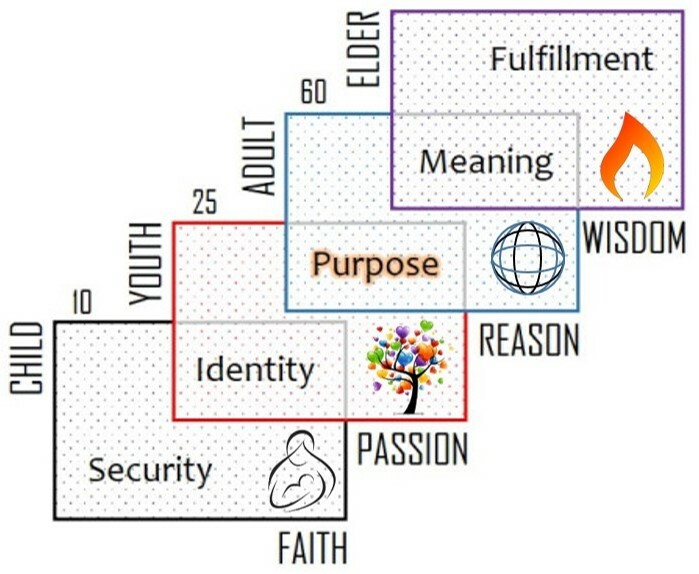 If we use a simple value metric such as 1=low, 2=moderate, and 3=high to identify our degree of self-actualization in each of the Four Ages, we end up with a series of numbers (e.g., 2-3-2-1) that represents our “self-actualization profile.” The purpose would not be to compare ourselves with others, but rather to bring to light where our human journey to fulfillment needs creative attention. It could be that traumatic events or inhospitable conditions of life early on got us hung up with anxiety over whether reality is resourceful, responsive, or reliable in any profound sense. A low value here would likely interfere with our self-actualization in subsequent Ages of Life. An insecure and defensive juvenile ego might completely eclipse a transpersonal intuition of oneness beyond the construct of identity in our later years (Age of Wisdom). I’ve argued that the obsession in some forms of theism with glorifying the (divine) ego and saving the (human) ego from extinction actually prevents the progress of spirituality in those religions from our soul’s true destiny, which is to release ourselves to the present mystery of reality. Despite such teachings in the tradition regarding the necessity of dropping the illusion of a separate self or dying to our seed-form so that the fullness of life can spring forth, a persistent concern with personal identity and what we deserve only intensifies the conceit and strengthens the illusion. Obviously it’s rather shortsighted to lay all the blame for our ego fixations at the doorstep of dysfunctional theism. An entire society, from religion to politics, from art to morality, from commercial interests to domestic initiatives, from its management of resources and consumption of goods to its disposal of toxins and waste, can be caught in the delusion of ego-grandiosity. The human journey begins in the uplift of a provident mystery, comes to unique expression in our personal aspirations, and finally passes through the veil of meaning where All is One. As a constructivist I regard meaning as something human beings create (construct) rather than search for and find in reality. While this has often come across as a radical and dangerous opinion, the idea that meaning might not be fixed and absolute is evident in our daily experience. The very same event or occasion can support numerous and even contradictory interpretations of what it means. We used to think that uncovering the bald facts underneath all these competing perspectives would give us “the truth” – its actual, essential, and eternal meaning. When we dug our way to this shining core of meaning – this supposed absolute, universal, and timeless truth – what we found was something that didn’t make sense without an explanation. In other words, we learned that language, words, and narrative are what we use to make something meaningful; without this human projection, reality is quite literally meaningless. To get at what’s behind this engine of meaning, this creative imagination that compels human beings to spin patterns of causality, identity, and significance, I’ve offered the notion of a “matrix of meaning” – something like a great loom upon which our minds compose the meaning of existence and construct the worlds we live in. My concept of the matrix incorporates the work of Joseph Campbell (The Hero with a Thousand Faces), Northrup Frye (Anatomy of Criticism), Erik Erikson (psychosocial stages of development), and James Joyce (specifically his idea of a “monomyth,” the single underlying plot that structures and informs all stories, or at least those worth telling). I’ve integrated the theories and insights of these authors into a framework of Four Ages of a human being, as carried in the perennial philosophy, which is a persistent and cross-cultural wisdom tradition that has seeded world religions and spiritual revolutions for thousands of years. Instead of promoting an orthodox “theory of everything,” the perennial philosophy encourages us to engage the present mystery of reality at our location in the evolutionary stream. Not male versus female, young versus old, insider versus outsider, or modern versus something else, but as an individual human being, right where we are. The diagram above illustrates this unitive theory of human nature and development according to the perennial philosophy, again with some clarifying insights from modern-day theorists. Let’s take a walk through the model and consider how it all fits together. At the center is a reminder from the work of James Joyce regarding what he called the “monomyth” at the heart of all great stories. It is the “one plot” worth telling and writing about; everything else in story supports and serves the integrity and advancement of this plot. Joseph Campbell named it The Hero’s Journey. Instead of seeing it as a kind of abstraction from the granular details of many individual stories, the monomyth is better appreciated as the structuring principle of narrative consciousness itself. I want to use Joyce’s term to name the “one plot” every human being is busy composing, with help from his or her family, community, and larger culture. It’s not something we sit down and write, like a screenplay of our lives, but is rather the shape of life – or the shapes life takes on – as we move through the major phases of our development as individuals. We all start from home and depart on a journey that inevitably takes us into initiations where our character is authenticated and disillusioned. In our search for deeper meaning and higher purpose we arrive at a point where security and control (if we still have these) must be sacrificed – given up but not thrown aside – for the sake of creativity, communion, and fulfillment. Upon our return we find that the business at home invites a double vision, allowing us to perceive a precious and eternal reality in the passing little things of life. This monomyth is like a hologram of fractal geometry, where the larger holistic pattern (the circuit just summarized) is replicated at more refined levels which play out in distinct narrative modes – what Frye named comedy, romance, tragedy, and irony. These modes correspond to the primary concerns that preoccupy human beings at the different stages (the Four Ages) of life: security in childhood (birth to age 10), freedom in youth (years 10 to 30), suffering in adulthood (years 30 to 60), and fate in later life (age 60+). Comedy turns the monomyth around a focus on security, usually where some higher (taller: adult) power is in charge, everything is in its place, and life is just boring enough to arouse curiosity in the protagonist (most often a child) about what’s outside the door, over the wall, or down the rabbit hole. True to the mytho-logic of the monomyth, the comfortable security of home will typically be thrown into jeopardy as the youngster loses his or her way, or gets captured by some wicked thing. The nature of comedy, however, ensures that a successful escape will be made and the frightened hero or heroine returns safely home again. Youth is the Age when the palace grounds seem limiting and oppressive: It’s time for adventure! The narrative mode of romance is not only about the lure of perfect (and even more irresistible, forbidden) love, but how the protagonist – and let’s not forget that we’re talking about ourselves – longs to explore (and transgress) the boundaries on freedom. He or she goes out in search of something, encountering obstacles and opponents along the way. The resolution to getting cornered or captured is not about making it safely back home, but rather overcoming the evil force and taking destiny in hand. Romance is the narrative mode most associated with heroes in popular culture. Our thirties are the favored time for stepping into careers and starting families: We are Adults at last. But with this transition we are also crossing into a landscape of deepening shadows. Responsibilities put limits on our time and energy, and our passion for life gets tethered to mundane commitments and deadlines. At some point – what I call the midlife reset (around age 45) – we can become positively overwhelmed by feelings of emptiness and disorientation. A decline in fitness and creeping challenges to our health, not to mention an increased frequency in our confrontation with death (older relatives, parents, and even close friends), force us to set aside many of our youthful dreams and ambitions. Suffering simply cannot be escaped, bravely ignored, or permanently medicated out of awareness. The crossover into the Age of Elder might see us becoming gnarled, bitter, and cynical. Or else, if we can follow the lifeline of our monomyth, a spiritual wisdom might ascend within us, even as our animal vigor is ebbing away. For so much of our life we had reached for light and run from shadow, held on to life as if death was the enemy, chased Utopias (“no place”) in future deals, better opportunities, greener grass, brighter lands, and otherworldly paradises. Now we understand – or are understanding more keenly – that light and shadow, life and death, good and evil, joy and grief, passing time and timeless eternity are many aspects of a single, profound, and ineffable mystery. The narrative mode of irony provides a way of contemplating existence at two levels (or more), where we no longer have a need to split reality into opposites and flatten out its paradoxes. A spirit (or the stomach) for not only tolerating such a communion of opposites but even celebrating it as the Golden Way (gospel, dharma, tao) into life in its fullness requires that we be at a place psychologically where the orthodoxies of Flatland no longer constrain us. When we are ready we will see that the Cross of dereliction is also the Bodhi tree of enlightenment; the hemlock in our cup is also the wine of new life. Death and rebirth (or resurrection) are misunderstood if we insist on arranging them in temporal sequence, as life after death. The dark principle, Lucifer, whom we frantically try to push behind us and out of our life, holds the light (Lucifer means “light bearer”) we’ve been too afraid to accept as our own. 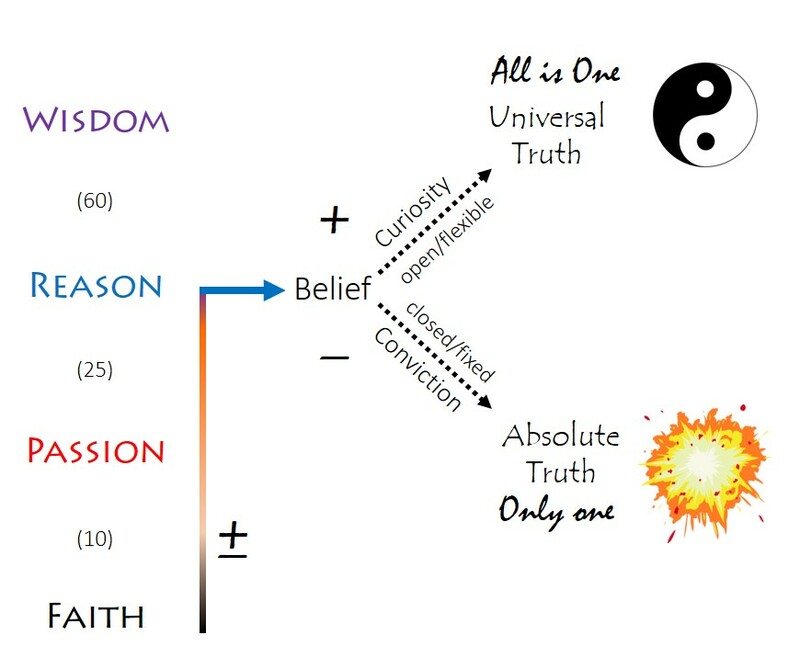 Across this matrix of meaning stand the great paradoxes of the wisdom teachings: security in suffering, freedom in fate. Grasped as a higher pattern, the monomyth offers us guidance as we construct meaning and compose our personal story. The truth of our story lies not in the facts, but in its power to carry a vision of what is still to come.